The casual boho wedding dress by Essense of Australia is simply a dream come true! Trend-worthy lace off-the-shoulder sleeves pair with a deep sweetheart neckline that lies just under the sheer lace overlay. 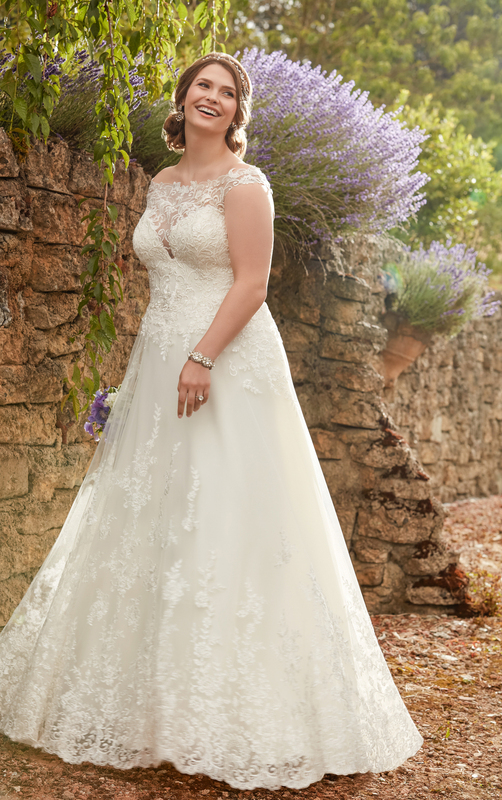 A wide hemmed lace skirt feels full without being heavy, creating a casually cool wedding dress. Lace and tulle over matte-side Lustre satin offer a relaxed A-line silhouette that features strong floral lace throughout. Light, casual and easy-to-wear, this designer wedding dress is perfect for the bride wanting a carefree gown. Pearl buttons over a zipper closure add just a hint of glam to the cameo lace back.